We are limited only by our reluctance to question authority. because it is a merger of state and corporate power"
In the 1978 TV series "Connections", science historian James Burke offered an alternative view of change. He suggested that rather than being developed in isolation, much of our modern technology is the result of various discoveries and inventions being built upon each other throughout history. A key part of this concept is that the people responsible for each of these stages of development were working in isolation and for their own interests, without any idea of what would develop from their collective efforts. It is the interplay of these 'connections' which Burke asserts is the driving force for change. If this is so then would mankind not benefit from a system where efforts are made to bring people and ideas together and so hopefully create more connections? Well, we can try and answer this question by taking a look at an existing system which appears to provide the framework for establishing lots of such connections - the top 500 American companies. 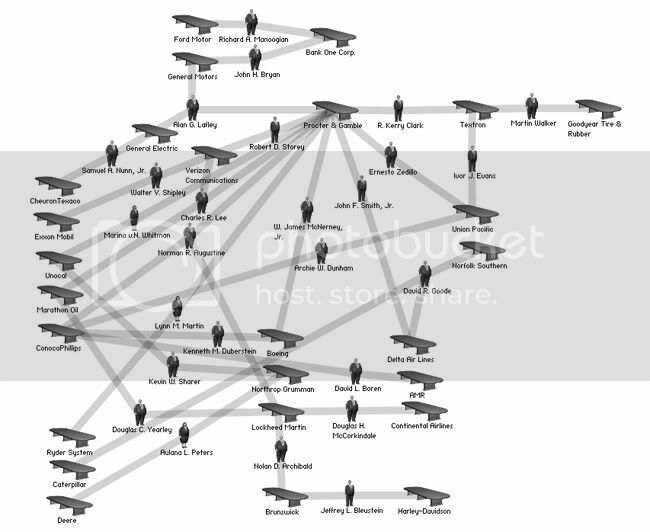 Connections within this system are made using interlocking directorships, where a company director sits on the boards of several different companies simultaneously. This in itself is nothing new, corporations have been using interlocking directorships for a long time. Their main purpose has always been to establish monopolies and cartels such as the trusts which arose in the late 19th century, most notably Standard Oil. To combat the monopolistic tendencies of large corporations, several pieces of antitrust legislation have been introduced over the years, but none has addressed the main problem of interlocking directorships i.e. their potential to create huge monopolies and cartels by stealth. To show you just what can be done with interlocking directorships I'm going to use this site because it lets me produce nice little graphics. Let's start with the basics. The illustration below gives three examples of interlocking directorships. As you can see, there's no limit to the number of directorships one person can hold. Now how can we use interlocking directorships to sidestep antitrust legislation? If William Gray was sitting on the boards of eight different oil companies then maybe the Federal Trade Commission (FTC) would be knocking on one of his boardroom doors. To avoid this all you have to do is use a third party boardroom to connect with the directors of other corporations, it's that simple. The example below shows how easy it is to connect two oil companies together and avoid the unwanted attentions of the FTC. Here we have Norman R. Augustine sitting on the board at ConocoPhillips and Charles R. Lee on the board of Marathon Oil. In theory they should not only be separate entities but also competitors, yet they both sit on Procter & Gamble's board. Ah but, I can hear these directors saying, we leave our oil company hats at the door of Procter & Gamble's boardroom and we don't discuss each other's companies. Yeah, sure, course they do. But why stop at two oil companies, why not connect lots of oil companies together and throw in a big chunk of the auto industry? No problem, just add a couple more boardrooms and a handful of directors to give you this. Now you may begin to see why most modern American vehicles struggle to achieve mileage figures not much better than those of a Ford Model T, especially after 100 years of 'progress'. Cars aren't the only things which run on oil though, what about planes and boats and trains etc? Can we pull some of those into our little network do you think? Again, no problem, add a few more boardrooms, directors and the job's done. Okay, now we've created huge monopolies and conglomerates, what else can we do? Well, it would be nice if you had the ear of government so that you can influence any policy and legislative decisions which may adversely affect corporations. You could leave it all to your lobbying people on K Street but you can also use the 'think tanks' there such as The Brookings Institution. Let's say you wanted the healthcare industry's voice to be heard in the White House. All you have to do is pack a think tank with representatives of the medical and insurance companies. Easy peasy, just like playing with lego bricks, click them all together and before you know it you've built yourself a nice big house. And when you run out of big bricks, you can always plug any gaps with little bricks. This schematic was produced using the Board of Directors information, as published on their websites, of De Vry, Hospira and Volcano in 2009. 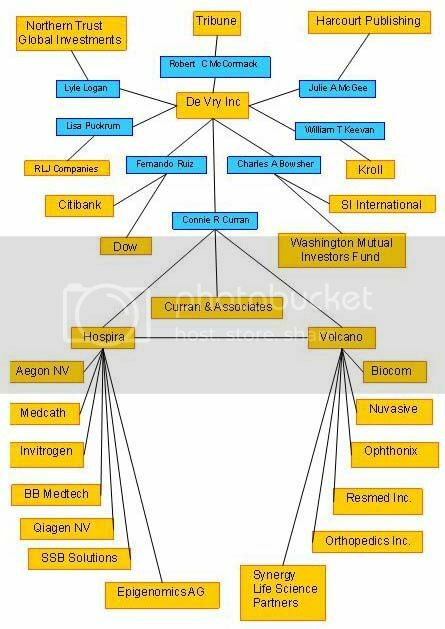 As it shows, it's not just the Fortune 500 companies that are all clicked together, all those smaller medical companies plug into Hospira and Volcano which in turn link to the big boys like De Vry, which I believe is now listed as a Fortune 500 company. It's all too easy to see this as some kind of huge corporate conspiracy, but a conspiracy on this scale would need a high degree of organisation, and organisation requires an underlying structure so that chains of command can be established. You can play around with They Rule for weeks and weeks but all you'll get is a bunch of scattered fragments, pieces of a jigsaw you just can't quite figure out. Well, let me see if I can put it all together and show you the big picture. I'll be using the 2004 data from They Rule because that's what I used when I started this blog, so some of the players e.g. Bear Stearns will have left the stage. But They Rule has now been updated to include the top 1000 US companies, so you can update and extend what I'm about to show you, but I believe the overall picture will be the same, if not worse. This system runs on money so that's where we'll start - with the banks. I'm going to put 14 banks up, expand their boardrooms and see what other boardrooms their directors sit in. My apologies if I've missed any big banks out, as a UK resident I'm not familiar with every American bank but I'm sure my American friends can fill in any blanks. This is what you get. I've left this in large scale so you can get get a sense of all the links displayed here because what you have to remember is that each link is a channel of communication. This picture shows 113 bankers, sitting on the boards of 132 of the top 500 US companies. That's an awful lot of boardroom information.But it doesn't stop there, now you have 132 more boardrooms to open up, which gives us another circle of 209 companies. Now let's open those up and see what we get. To produce this next image I had to condense all of the companies and directors down so everything would fit on one screen. I started this diagram in the middle of the screen because I thought I would need more space than I did. So you'll have to scroll down and right to see it. If you do this quickly enough you'll be able to see the system assemble itself as it takes several seconds to load all of the graphics. Welcome to the machine. This is what politicians, economists and business leaders laughingly refer to as 'the economy' or 'the free market economy', when it would be more accurate to call this system 'The Company', because that's what it is, a single corporate monolith. What you are looking at is the corporate structure of America Inc.; a huge web of corporations, all linked together by interlocking directorships, with the banks sitting at it's centre, running the whole show. Now, what can we say about this corporate structure? I'm not sure whether it answers more questions than it raises, but I haven't got the space to deal with all of them so I'll try and briefly summarise a few of the more important ones. The rest I leave to you. With access to all of this company information, it should come as no surprise that the banks' investment divisions post huge profits. They can't lose, they have all the games markets rigged. Channels of communication work both ways. The banks are able to issue instructions/orders/commands to all their satellite companies. This enables them to create any economic conditions they like, whenever they like. Every dollar you spend rings up in the same register; there is no freedom of choice. The Company effectively employs, houses, feeds and clothes you. You really do owe your soul to the company store. This is economic slavery, and for those thousands of Americans who die each year either through lack of, or inadequate medical insurance, there is a case for calling it economic genocide. The pace of technological development can be completely controlled. From it's Dantesque inner circle of banks to the outer reaches of it's corporate tentacles, this machine has been designed to facilitate a process - the transfer of all wealth and resources from a common inheritance to a minority ownership. This is achieved by each company overseeing it's own little process. To better understand this you have to learn to see things as processes rather than objects. For instance, you may see a car as an object which has been manufactured in response to consumer demand for personal transport. But you can also view it as a process i.e. the conversion of steel, glass, rubber and other materials into money. The same applies to a big mac i.e. the conversion of cheap food, salt, sugar, fat and chemicals into money. That is all that corporations are for, converting resources into money. And ultimately, money translates into power. That's what this system is all about, not money and greed but power and control. The ways of Empire never change. What are we to make of economists? Without their free market touchstone, all of their predictions and proposed solutions have no more validity than a handful of bones cast in the dirt. But there is a way to make sense of today's economic realities. When you hear politicians and business leaders use the term 'the economy', try replacing it with 'the Company' e.g. change "Taxing the wealthy will hurt the economy" into "Taxing the wealthy will hurt the Company". Gives you a whole new take on things doesn't it? Such is the power of words. Of course, not all economists will have malice aforethought, some will be blissfully ignorant of events behind the scenes and be merely parroting the stock phrases they learned in economics school. You must be the judge on which side of the curtain each individual stands. I can't begin to estimate how much money is generated by this system but it must run into the trillions of dollars. With a wallet this big the Company can buy any politician or regulator they choose. They bought your Congress a long time ago; they have had your Executive since the Reagan days; and, with Citizens United, they have your Judiciary. The Company is now your unelected, de facto government. All policy, domestic and foreign, is dictated by the Company. This structure did not occur by accident, nor did it happen overnight. It has been carefully planned and put together over a number of years, in the shadowy darkness which lies behind closed boardroom doors. And through all of that time, while the banks and corporations have been constructing this corporate machine in private, they have continued to spew out their free market mantra to the public, knowing it to be a pack of lies. This isn't mere hypocrisy, nor is it arrogance and contempt for the public. It is nothing less than a conspiracy - on a colossal scale - to deceive and defraud the American people. There was a time when I thought Sinclair Lewis would have been proved right, but not any more. When fascism came to America it strolled out of Goldman Sachs' lobby, wrapped in Armani and carrying a copy of The Wall Street Journal. As the title of this piece suggests, the whole system is indeed a circus, where the ringmasters present act after act for your entertainment, from the Amazing General Electric Tax Jugglers to Max Baucus and his troupe of yellow (sic) dogs jumping through healthcare hoops. And in between these star performers they'll send in the clowns, so you can have a good laugh at the demented ravings of half-baked lunatics with hotlines to God. But all of these are mere distractions, shadow puppets for you to chase and shake your fists at, while behind the curtain, the machine slowly ticks over, transferring power from you to the banksters. Well it's time to put the elephants back in their cages and turn on the house lights. As Henry David Thoreau might have said were he alive today: "Quit hacking at branches, grab the dynamite and let's get rid of the root." So to all those who occupy: when they ask you what your demands are, demand that your government puts an end to this system of economic tyranny. Demand that they introduce antitrust legislation which specifically prohibits multiple company directorships, thus severing the ties that bind this machine together. Demand that they break up the big banks into smaller entities which will no longer be able to hold so much economic power over society. After all, they were moaning about being too big to fail. So cut them down in size; then we'll see who lives and dies by capitalism's sword. Demand that all the bankers and company directors who are part of this corporate cabal be brought before a court of law and - considering the scale of this criminal enterprise - charged with crimes against humanity. And if your government refuses (as no doubt they will), then you must put an end to your government, for you will know them to be nothing more than Company employees, hired guns, paid to do the Company's dirty work. Their employment contracts are written in blood: the blood of the 29 miners who died in the darkness of a West Virgina coal mine; the blood of the 11 oil workers who died in the watery isolation of the Gulf of Mexico; and the blood of the countless thousands of others who have suffered and died at the hands of this corporate Death Star, all because the machine demanded that a dollar be turned over a few seconds quicker. You have to do this, you have no choice, because if you leave this corporate structure intact, then you will have condemned your children, your children's children, and their children's children to a lifetime of having their faces ground into the dust by a Company boot; the dust of what they once told you was the American Dream, a lie so noble it has succeeded in enslaving the population of the richest, most powerful nation on Earth. That dream has become a nightmare. It's time to wake up. And for those of you outside of America who may think that this is exclusively an American problem, I urge you to look closely at your countries' 'economies', for I suspect that you will find this same corporate structure echoed around the world, much like the politicians' concerns over budget deficits and the bankers' demands for austerity measures. America Inc. is but one division of Global Inc.
Give me Chardonnay or give me death!